On Friday I went along to the monthly Critical Mass again. I managed to arrive just in time this month for them setting off from the foot of the Mound at 6pm. This month seems to have been busier that the previous two months. There was about 44-55 people on their bikes there. This month there was no major problems. Unfortunately at a few points there motor vehicle getting into the middle of the group, but we managed to sort that out quite quickly. Also on our way up Leith Street, when we were stopped at the traffic lights, there was two police cars coming up behind us with their sirens blaring and lights flashing. Unlike motor vehicles, we were able to rapidly shift over to one side of the road and on the pavement and let them past. In true Critical Mass style at the last minute, we decided to head to an off-licence and then the Meadows for the after cycle drink and chat instead of the usual trip to The Peartree pub. Unfortunately the GPS has gobbled my GPS logs again, so I had to re-create the route from memory. This entry was posted in Critical Mass, Cycling, Edinburgh on July 29, 2007 by smsm1986. Since installing the Quicktime 7.2 and iTunes 7.3.1 updates on my MacBook, I’ve been unable to launch PPC applications through Rosetta. It appears that having Java 6 installed has caused the prebinding process to crash. Following the process documented in a comment by Darlene on a blog, I’ve been able to launch PPC applications through Rosetta again. The process is basically removing Java 6 and then force running the prebinding process. I didn’t even need a restart which is nice. EDIT: I’ve also had to download and install Java for Mac OS X 10.4 Release 5 to get Java working again. This entry was posted in Apple, beta, bug, Java, Mac OS X, MacBook on July 25, 2007 by smsm1986. Picasa Web Albums has now caught up with Flickr and started to properly support GeoTagging of Photos. I have however found a bug in the iPhoto uploader plugin. Basically if you have used a GPS track to Geo tag your photos, if you compress the photos on upload, then you will lose those Geo Tags. As a point of note, you need to enable the GPS tag reading as described in the Google Help. I have posted to the Google Web Albums Google Group to see if any one there has come across the problem too. This entry was posted in bug, Google, Pictures on July 13, 2007 by smsm1986. Some people thought that I done a lot of cycling? Many people have commented on the various day cycling trips that I’ve taken. However yesterday when shopping, I found someone who has been doing a lot more cycling than myself. He took the train from Cambridge up to Inverness. Then he started cycling and camping rough. That was two months ago. He was taking everything he needed in panniers on his bike. He was looking at doing around 50 miles each on the way back down to Cambridge. See the attached photo of his bike with the panniers full. This entry was posted in Cycling, Edinburgh on July 7, 2007 by smsm1986. On Friday I headed to the Edinburgh Critical Mass again. It was a lot busier than last month, which meant that it was better perceived by the public. As the route of the Critical Mass is not predefined, it is very easy to change the route. When we tried to turn right from Princes Street into North Bridge, no vehicles were allowed, so instead we headed down Leith Street. Part of the Critical Mass route (I was late so it’s missing the start). After Critical Mass, I took a little detour home by going via Crammond Island. I’ve stuck the photos on to Flickr seemingly Yahoo maps doesn’t actually have Crammond Island. 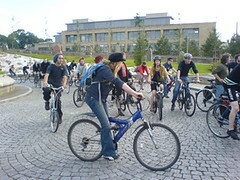 This entry was posted in Critical Mass, Cycling, Edinburgh on July 1, 2007 by smsm1986.